"Two comfortable alternatives for the Hawk GT! Gunfighter features slick formula solo looks and rider comfort while the Gunfighter & Lady offers comfort and style for two with optional passenger backrest. Both models feature wide neutralized seating platforms that reduce the tendency to slide forward. 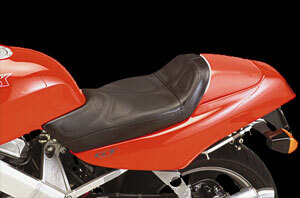 Ergonomically designed seating provides even support for more time in the saddle. 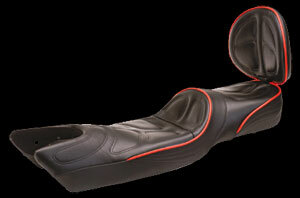 Gunfighter & Lady saddle accepts optional removable passenger rest for added comfort and passenger security. Passenger rest has an angle adjustment to tailor it's position to individual's posture. Choose from a variety of styles to suit your taste and the amount of support desired. All components come standard with genuine leather seating for a luxurious ride that breathes with your body. Choose from a large variety of styles and textures at no added cost. Leather will provide many years of quality service as long as you care for it with a quality conditioner like our Saddle Cream." Если коротко, то фирма делает седла из качественной кожи множества цветов и текстуры. Есть варианты для одиночки и для езды с пассажиром. Для второго номера предусмотрена откидывающаяся спинка (вот только поддерживает она отнюдь не спину).